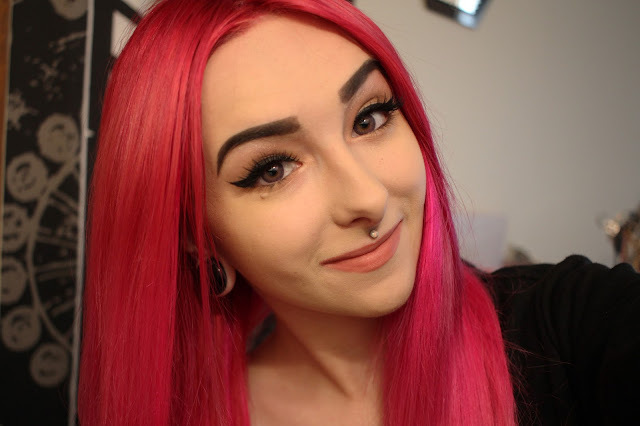 For a long, long time I was really into circle lenses and I've recently gotten back into them with the help of www.GeoColouredLenses.com! They had so kindly sent me a pair for review so here is what I think of them! Geo Coloured Lenses are the only brand of circle lenses that are currently approved by the US Food and Drug Administration (USFDA) as well as they have gained International Organization for Standardization (ISO) and Conformite Europeenne (CE) certification. This is incredibly important because when you're putting something into your eyes you need to be very careful and there are a ton of brands out there that may not be the best for your eyes. It means you can be sure you're ordering safe contact lenses while still getting your desired look at really affordable prices! Also, on top of being very approved, they also have a way for you to see if you are actually receiving real lenses, perhaps from a reseller. All Geo Coloured Lenses come with a sticker on each vial that has a hidden unique serial code that you can go on their GEO Anti-Fake Website and see its authenticity. The lenses that I chose are the Tri Coloured Violet lenses and since I am super duper blind they gave them to me in the prescription -7.50 (Both my eyes are the same prescription, you can chose your left and right eye to be different) which is lovely that they supply that prescription. The majority of the circle lenses they sell can be purchased with a prescription! They also offer free international shipping and a free contact lens case with every purchase of a pair of contact lenses. I personally really appreciate this because living in Canada there are a lot of companies that do charge for shipping and it really starts to add up. If I know I can purchase anything from Geo Coloured Lenses and know it's free shipping, I am sold. As you can see these are a super gorgeous violet colour that fades into a lighter purple/pink and then into a gorgeous orange-gold, the tri colour, to really make your eyes pop. Even on my super dark brown eyes you can see these colours so I'm pretty impressed with that. 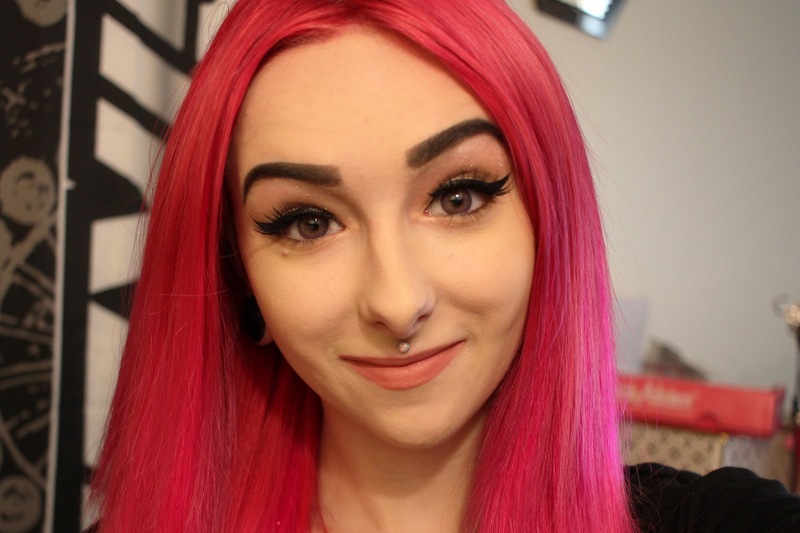 Please check out Geo Coloured Lenses on their Facebook, Instagram, Tumblr and Pinterest! They post offers, updates and customer photos there! They also have supplied you guys with a coupon code which is Kittendoll10 for 10% off at checkout and it never expires! It can be used for anything except for combo and sale items as they're already discounted! 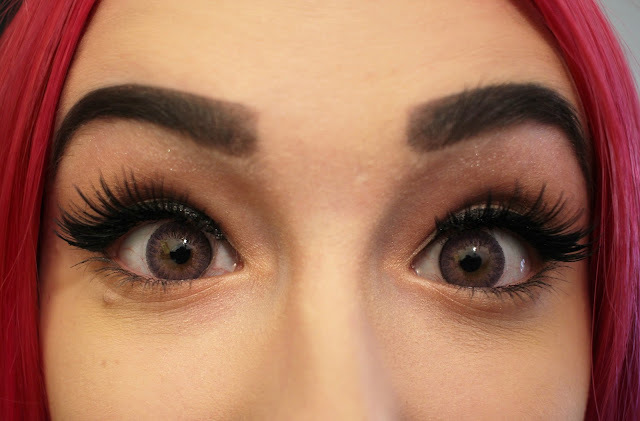 Have you tried circle lenses before?